Should You Buy or Lease an Office Printer? | Brumley Printing Co.
As we’ve discussed many times, using a reliable commercial printing company for larger projects makes sense for most businesses. But even small mom and pop businesses need a reliable office printer to handle their smaller, day-to-day printing needs. But should you buy or lease your office printer? There is no right or wrong answer to the question. It all depends on your particular circumstances. Here is an overview advantages and disadvantages to help you make an informed decision. Lower initial expense: Leasing typically requires less of an initial outlay of cash than buying. Flexible terms: Leases usually offer more flexible terms compared to outright purchases. Upgrade more easily: Leasing is one of the best ways to deal with the problem of obsolescence because updating and maintaining the printer is usually the responsibility of the lessor. Leases are tax deductible: You’re allowed to deduct your lease payments on your tax returns as business expenses, effectively reducing the net cost of the lease. You don’t own the printer: Unlike with purchases, leased printers have to be returned at the end of the lease term. You’re obligated to pay for the entire lease term: You’re under obligation to make payments for the lease period even if you stop using the printer. Higher total cost: In general, leasing costs more in the long run because monthly lease payments are almost always higher compared to buying a printer outright. Ownership: When you buy office printer, it belongs to you. This can be a major advantage if the printer has a long life. Tax advantages: Section 179 of the IRA Code allows you to deduct the cost of certain newly purchased items in the first year. Depreciation deduction: Your purchased printer can be depreciated to lower your taxes. Higher initial cost: High-end office printers can be expensive. Getting stuck with an obsolete printer: This is especially common with high-end printers. Constant changes in printer technology mean you risk getting stuck with out-of-date printer just months or years after purchase. When deciding whether to buy or lease your office printer, consider the total cost and tax implications of each option, and go with the one that best fits your needs and budget. 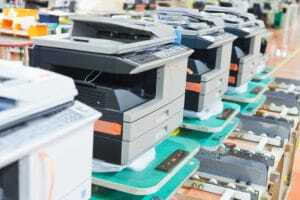 We hope this article helps you make the best decision when it comes to buying or leasing your office printer. And we hope you’ll consider Brumley Printing Company for your larger printing jobs. Call us at 817-336-5551 to learn about our full line of commercial printing services.